As we were setting up our exhibitor’s booth this year at PackExpo, we were approached by Craig DeMello, Application Engineer for Soft Robotics in Bedford, Massachusetts. Soft Robotics enables robotic automation for large markets and labor-starved industries such as food and beverage, advanced manufacturing, and e-commerce and retail. Leveraging patented material science and AI algorithms, Soft Robotics designs and builds automation solutions and soft robotic gripping systems that can grasp and manipulate items with the same dexterity as the human hand. He showed the defective encoder to Tracey Howard, Global Marketing Manager for EPC (see photo, at right), and asked, “I’m guessing the answer is no, but I don’t suppose you have anything that would work?” Fortunately, EPC could help. 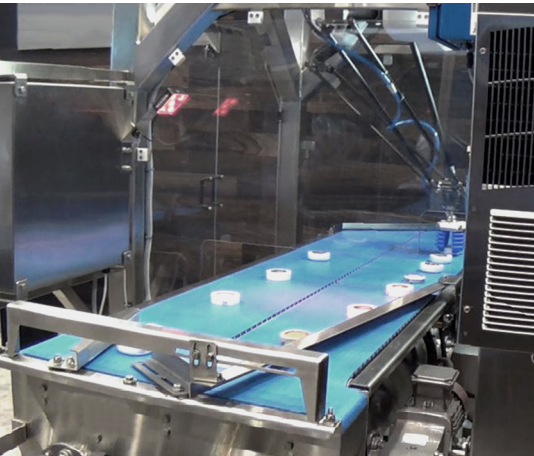 The demo has side-by-side conveyors that run while a Soft Robotics gripper on an ABB FlexPicker quickly executes pick-and-place tasks from above. The shaft on the encoder on the gearmotor driving the demo’s front conveyor had snapped off. Tracey Howard found the solution: the Model 25SP, a Size 25 programmable shaft encoder. 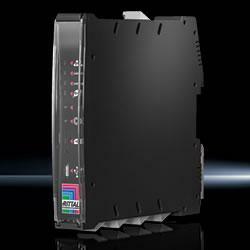 “Craig showed me the defective encoder and told me what specs they were looking for. I cross-referenced it on the fly, and the programmable Model 25SP was the obvious solution,” explains Tracey. Program any resolution from 1 to 65,536 CPR – that’s 262,144 counts using 4x quadrature counting. These programming features allow a single encoder to be configured for multiple applications, enabling one encoder to replace many different part numbers, providing cost savings on inventory and down-time replacement. The Model 25SP Accu-CoderPro™ comes standard with dual bearings rated 80lbs axial or radial, and can be specified with up to IP67 sealing. Some configurations are even in stock and ready to ship. So even if we can’t hand you the encoder to you when you need it, we can ship it out right away. In this video, see how quick and simple it is to program the Model 25SP. Or click here for the product specs. 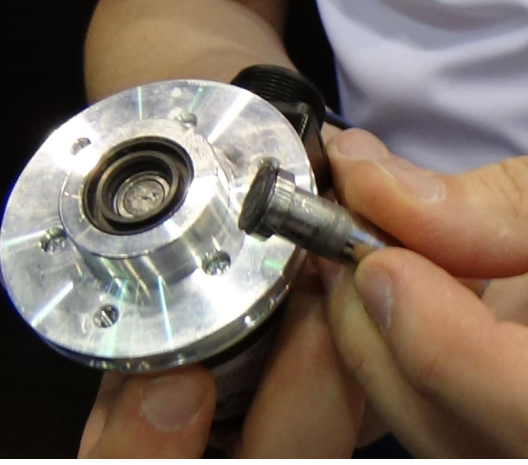 Competitor’s encoder with shaft snapped off (above). Soft Robotics needed a replacement on their machine FAST (below). 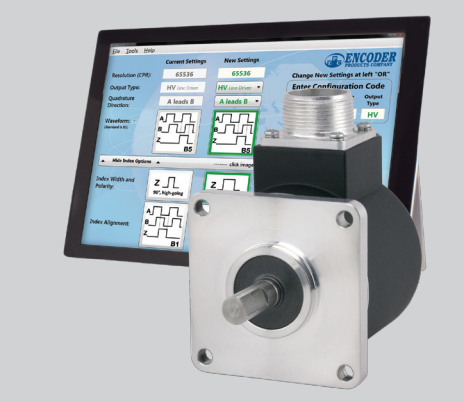 EPC’s Accu-CoderPro™ programmable encoders are specifically designed for the challenges of an industrial environment. Contained within the rugged, industrial housing is an advanced set of electronics that allow the encoders to be programmed to your exact application needs. Choose from 6 different output types, 32 different waveforms, and program any resolution from 1 to 65,536 CPR – that’s 262,144 counts using 4x quadrature counting.